Environmental factors of many industrial heating applications require a product with the ability to withstand chemicals, moisture and abusive treatment. These same applications also require rapid heat up, steady temperature maintenance, and uniform heat distribution. For applications such as these, OMEGA silicone rubber heating blankets are the best products available. 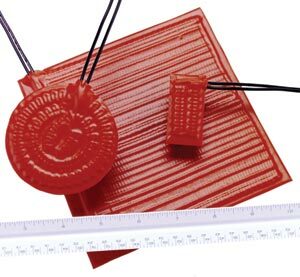 OMEGA silicone rubber heating blankets are used for freeze protection, process temperature control, melting of solids, temperature heat-up or maintenance. Whether installed in Original Equipment or in the field, our silicone heaters will provide the durability required. Not all part number combinations are valid ! 참고: * To Order with PSA (Pressure Sensitive Adhesive) add suffix “P” to Model Number. To Order 96" leads, add suffix “-096” to model number and $38.00 to price.